"Sic Oritur Doctrina Surgetque Libertas." "Thus learning is born and liberty will arise." With the unveiling of this newly redesigned website, I also release my most ambitious project. 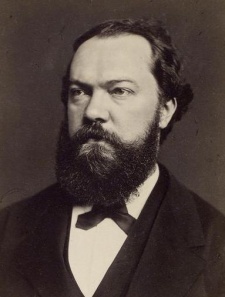 This is Eugen Richter, a German politician and writer prominent in the late 1800s. His most popular book was Socialdemokratische Zukunftsbilder. After its initial translation and dissemination, it faded into relative obscurity. I recently discovered and read the book. I found the language old and unclear at times. That is why I have gone through and updated the translation. This new translation is available now under the "Original Works" section of the bookshelf.